Pulmonary thromboembolism is a blockage in an artery, which can lead to risk of death if not spotted early. Each year there are around 100 to 200 cases for every 100,000 people. The current methods used to locate these clots employ some use of radiation, but a new method using magnetic resonance imaging with target specific imaging probes offers a potential alternative option for the future. Lung with pulmonary artery containing thrombus due to thromboembolism. Reorganization of the thrombi (right) and congestion of the alveoli. Thrombosis of lung. The pulmonary thromboembolism blockage is usually a blood clot which is a combination of fibrin, a chain-like protein made of fibrinogen, platelets and coagulation factor-mediated peptides. This blockage often originates in one of the legs and travels to the lung where it can be dangerous. The size of the clot can vary: some are very small making them difficult to detect. A patient may be suspected of having a blood clot when they encounter symptoms such as chest pain, shortness of breath, a cough, leg pain, dizziness and fever. 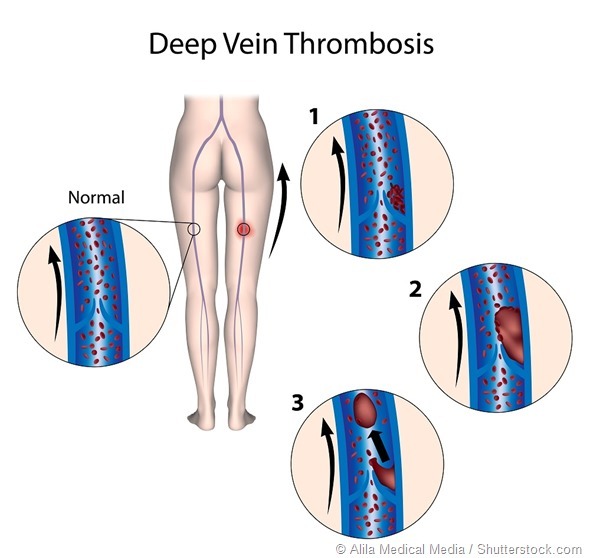 Often the clots are a result of deep vein thrombosis but they can be triggered from a tumor, air bubbles and bone marrow. Medical teams usually detect the condition from methods that employ some form of radiation. One diagnostic method is contrast-enhanced computed tomography (CT), a radiation method that uses x-rays and dye to show the insides of the patient’s body. Another method is ventilation-perfusion scintigraphy which measures and analyses the air and blood flow in the lungs of a patient. The patient inhales a radioisotope gas to create the ventilation scan. For the perfusion, radioisotopes, which have excess nuclear energy, are injected into the vein and their progress monitored. Clinical teams would ideally like to minimize the use of radiation in medical processes to ensure that patients are not irradiated unnecessarily. Researchers have been investigating an alternative process that makes use of magnetic resonance imaging (MRI) as an alternative. MRI is capable of producing an image of soft tissues in the body using radio waves and magnetic fields. However, early attempts at using this imaging method to detect pulmonary embolisms in the lung found that the technology on its own is not sensitive enough and does not produce a clear enough image to be clinically significant. However, a group of scientists has developed a process which has produced interesting results by making use of what they know about the composition of a blood clot. Previous research has focused on the fibrin components of clots as a marker for the thromboembolisms. This research focuses on the platelets to consider whether activated platelets will reveal a pulmonary thromboembolism through magnetic resonance imaging. For this the researchers decided to conduct an experiment using a contrast agent of MPIO-labeled single-chain antibodies which is attracted to platelets. The research relies on the fact that activated platelets have Ligand-induced binding sites (LIBS) of the GPIIb/IIIa receptor. MPIO is an iron oxide which can react very well with MRI to give a good and clear image. MPIO-labeled single-chain antibodies with a contrast agent will bind to platelets when they are activated and will be detectable via MRI. However, a control group of antibodies, control-MPIO, will not. The scientists triggered thromboembolism in mice to analyze their theory. They injected the mice with human thrombin. This resulted in different levels of thromboembolism in the study animals. The obstruction can be graded in size from I – IV. This process was followed by injecting the animals with either the LIBS-MPIO or the control-MPIO about 30 minutes after the initial thrombin injection. The results were compared using MRI and it was found that the LIBS-MPIO had much higher MPIO binding than the control. The animals were assessed using a BioSpec 94/20 Bruker MRI before and after they were injected with the thrombin. The animals were also put under anaesthesia during the process to help keep them as still as possible. The MRI revealed that after the injection, there was a T2 signal for mice with thromboembolisms using the LIBS-MPIO contrast agent. The amount of contrast agent also increased in the location of the edema tissue for the thromboembolism. The quantitation of MPIOs in each example tended to relate to the size of the embolism produced in the animal’s body. The process has the potential to further expand the ways that pulmonary thromboembolisms can be detected in adults and children without the use of radiation. Further research needs to be carried out before the process is used in diagnosis in a clinical setting.